Acqua di Parma launched Iris Nobile in 2004. The fragrance was created by Francis Kurkdjian and Francoise Caron and features notes of iris petals, star anise, mandarin, bergamot, cedar flower, orange blossom, iris roots, vanilla and amber crystals. Iris Nobile starts with sharp, sparkling citrus and strong undertones of anise. Over the next 20 minutes, the anise fades, and in its place comes a soft orange blossom over a bed of buttery iris. The iris itself is very delicate and subdued, with just a whisper of powder. It is an elegant, unobtrusive, very feminine perfume. It is lightly sweet, but not overly vanillic, and I do not notice the amber. There are no earthy notes, and fans of the dirt-caked-roots style of Hermès Hiris, Serge Lutens Iris Silver Mist, and The Different Company Bois d'Iris may perhaps be disappointed. Personally I need all four fragrances. Iris Nobile is an Eau de Toilette, and it is very light — a little dab does not do it justice. I first tried it from a mini splash bottle, and I hardly noticed the citrus or the anise, and found it very short lived. I thought it was pleasant, but not something I needed to buy. Later a spray sample came my way, and I was hooked. Two sprays last about 4 to 5 hours on me. 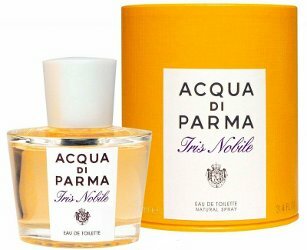 Acqua di Parma Iris Nobile is $74 for 50 ml, and is also available in 100 ml, bath salts, soap, body lotion, and deodorant spray. For purchasing info, see the Acqua di Parma listing under Perfume Houses. The review of Acqua di Parma Iris Nobile Eau de Parfum, which launched in 2006. Here's the weird thing: the first time I ever smelled Iris Nobile, it vanished in a second. I smelled nothing after the topnotes evaporated. Emboldened, I took my mini home and put on a healthy splash. It became instantly unbearable. It was the most “perfumey” nose-itching headachy thing I had ever put on. I scrubbed and scrubbed and could not get it out. Yuck! So bizarre. Same here. I found it more agressive than P. Bourdon's Iris Poudre, a scent I like. I agree this is a lovely Iris. Soft, feminine but sadly on my skin, gone in less than 10 minutes. Oh well – I still have Hiris but now you have me missing my decant of SL's Iris. What can I say, obviously you are both crazy, LOL! And won't be surprised if you are joined by more crazies as the morning progresses. This seems to be a love it or hate it fragrance. F, have you tried the TDC Iris too? I love all of them. Hello R! I like this but it lasts 10 seconds on me. I love iris perfumes. Lately have been very taken by TDC Osmanthus – another topic I know! Have a great 4 July weekend. Isn't it amazing how a spritz, as opposed to a splash, can make all the difference, R? I wish TDC Osmanthus worked for me, it is usually one of my favorite floral notes. You have a great weekend too N! Yes — another great example. I am so glad I took a chance and bought the Divine Bergamote. It was extraordinarily fleeting from a sample vial, but lasts for hours from the spray. I found Iris Nobile unexpectedly soapy, and was disappointed (I like Colona Assoluta, or however you spell it!). I simply couldn't get much iris from it. But perhaps, as you say, you need to spritz rather than dab. I splurged on TDC Bois d'Iris recently, because I liked it from the dab, but sprayed liberally it is a different beast – much more vibrant and delicious. Luckily I like the spray version even more than the dab. What is it about the spray that changes the nature of the scent, I wonder? So interesting to read all these reactions. I don't get soap at all. But we have different tastes — I really don't like Assoluta. And I'm not sure what the difference in spray vs. dab is. Obviously, you're going to get more juice on your skin if you spray, but I would swear there is more to it than that. Oh dear — anise, iris and orange blossom — three notes I'm not fond of. I can skip sampling this one. Despite it being my namesake flower, I'm not a big fan of iris. I have yet to find an iris fragrance to love. FM Iris Poudre is the only one I halfway like. But I will keep sampling iris scents because everyone kindly sends me iris extras! I liked this a lot at first, but it lost its allure somehow. Hazy drydown, methinks. Gone on my skin after 10 minutes and was a little too sweet for my taste in the opening. Prada Iris and Miller Harris Terre d'Iris are my favorites! I feel the same way about patchouli — can just skip patchouli scents entirely. All the same I am expecting to be surprised one day and fall it love with one! The Prada Iris was nice but I didn't love it. Need to get my hands on the Terre d'Iris! And the new Cuir d'Oranger. I agree about the Cuir d'Oranger— I'm cuirious. Drat MH for making these exclusive to her London shop! Just tried to comment on your blog & it wouldn't let me. Love the latest batch of drawings! This is the most beautiful fragrance ever that iris nobile, BUT – it's the eau de perfume. I'l tell You, I own tens of bottles of perfumes, it's like I'll buy one, it'll start boring me, I won't finish it, I'll buy another perfume and it's like that all the time… I'm a perfume freak, I spend most of my “spending” money on perfumes. Usually I go with the oriental ones, cause they last long and have some depth. Now, I'll tell You, Iris Nobile EdT smells very nice, but You're right, doesn't last too long. Iris Nobile EdP lasts FOR HOURS. It's almost like they're not the same fragrance! I get more compliments on Iris Nobile than I get from wearing coco mademoiselle – now, people in the same room tend to like when a person's wearing coco. But Iris Nobile EdP smells even more attractive to them! I love it, it's the most sparkling, BLOOMING on my skin perfume I've ever smelled, it radiates so many beautiful notes all day long, it's amazing, You see my name? See how hooked I am? And I bought this from Sephora UNSMELLED. Glad you've found a favorite! LOL — I'm so used to fanciful notes that I hardly notice them anymore. I think I tried the EDT version today; should've checked the bottle more carefully. Really wanted to like it, but the blast of anise really got to me. Did become softer later on though. You hate my favorite part! Ah well, there's still the EdP. IrisNobile, I can see why you named yourself after this! The edp is just as you say. It BLOOMS. I'd had a sample of the edt and liked it well enough, but then passed by a tester of the edp at Holt Renfrew while checking out the men's section. It stopped me in my tracks! It was so intensely feminine that it seems laughably out of place in with the masculines — and by contrast with them, seemed that much more golden and satiny and. . .well, beautiful is actually the perfect word for it. It also is blessed with good sillage and length on the skin. I will think of it and you fondly now whenever I read your names. Really like this one, reminds me of Rochas ‘Femme’. But, I found it faded quite fast. Not what I’d call a stayer, but very, very nice. Maybe try the EdP…it is longer lasting.